Hand your partner his fishing pole, kiss him goodbye out the door and tell him while he is out fishing you’ll be Gone Bingo! Everyone needs some time just for themselves and playing online Bingo is the perfect outlet to unwind and treat yourself to bingo. At Gone Bingo there is always room for one more. Gone Bingo is an excellent and innovative bingo website. Since its launch in 2006, Gone bingo has constantly improved their already impressive site with new games, slots and offers. 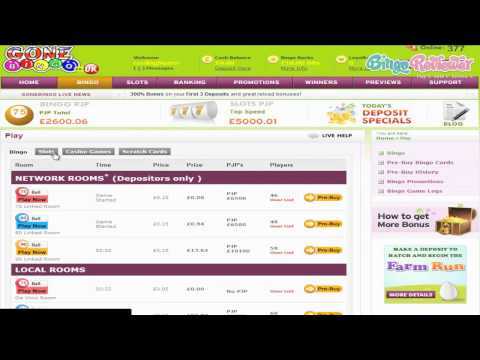 Gone bingo offer a huge variety of bingo rooms with an even more extensive list of side games. They also have offers that other sites can only dream of. The homepage is simple and easy on the eyes. Gone Bingo is powered by Cozy Gaming software, this means a huge variety of games and smooth navigation is eminent. The site itself stays true to early designs with a green and white color scheme which is downright fresh when compared to other bingo sites and doesn’t need an overdone look to be inviting. All the vital information, help menus and game descriptions are available from the homepage and everything is easy to use and access. Gone Bingo is part of the Best Bingo Network is licensed by the Malta Lotteries and Gaming Authority. Gone bingo offers a host of games; 30, 80, 75 and 90 ball rooms. There are not too many sites offer such a vast variety options. The rooms are very well thought out and run smoothly, with lots of players around to chat with. Using the Gone Bingo chat feature could not be easier and it is actually very well designed when compared with other systems on similar bingo websites. There are drop down menus and special chat buttons which make chatting a very simple process and help to speed things up. The Gone Bingo team of chat moderators is very knowledgeable and is willing to help out players who might have questions. There are Jackpots galore including Progressive Bingo/Slots Jackpots, Guaranteed Jackpots and special Jackpots with huge money up for grabs. They not only offer bingo, but also offer a great range of other games. The huge array of slots has been well designed and there is a large selection to choose from. The games are of excellent quality and it is obvious a lot of thought has gone into them. If you get bored with bingo or just fancy a change, you could have hours of fun playing the other games available. They run smoothly and there are some pretty decent pay outs too. At Gone Bingo you have choices and that is a plus because every player has individual needs and desires. Play absolutely Free after verifying your email and completing your profile. Claim your Welcome Bonus offer and take advantage of the Reload Bonus where you can choose between a fat Bonus or Cash Bonus. Deposit and have a chance to play the Spin and Win Bonus Wheel where a chance to win £1,000 is possible. The Monthly offers heat up and correlate nicely with themes that relate to holidays, events and seasons. At Gone Bingo friendships are important and they welcome you to invite them. A nice Bonus Money reward is given to every friend that successfully joins. Gone Bingo has built a solid reputation in the UK with a large volume of players at any given time that keeps the bingo prize pools at impressive levels. Their reputation is one of the best in the online bingo industry. We rate Gone Bingo with 4.5 Pink Hearts.